The weekend just vanished in a jiffy. All of us went to the nearby park in the evening on Sunday evening to unwind. Met some friends from the neighbor hood and caught up on the local news. The area is gearing up for the upcoming voting day. While the seniors enjoyed a good debate on the current affairs, preferences and priorities to be looked into, all the kids had a great time playing and running around. Wash rice and let it soak for 10 mins. Cut the onion into juliennes. Slit the green chilllies. Clean and wash the coriander leaves and grind it to a thick paste adding just little water. Heat a pressure cooker and add the ghee and oil together. Add the cardamom, cloves, cinnamon, star anise and fennel seeds and roast till the aroma arises. Add the onions and sauté till they turn pink. Add the green chillies. Next goes the ginger garlic paste. Mix well and add cashews, red chilli powder, garam masala powder and mix well. Now goes the ground coriander leaves paste and curd. Mix well. Add 3 cups water and let it come to a boil. Now add the soaked rice, salt and mix well. Close with the lid and cook for 2 whistles over medium flame. Flavorful Kothamalli biriyani is ready. After opening the cooker just fluff the rice with the fork for even mixing taking care not to break the rice. Serve hot with onion yogurt raita. Chop the onion into juliennes. Chop the tomatoes finely. Mix both with the curd. Add salt, chat masala and coriander leaves and refrigerate till you serve. You can add fresh green peas while making the rice. You can also grind fresh ginger and garlic along with the coriander leaves while grinding instead of using G-G paste. That is what I did. Use green chillies as per you spice requirement. Green biryani and raita both together makes me hungry even after having my lunch..delicious pair..
hmmmmm…. this looks good… coriander rice is a family favourite… slurp! Wow, it looks yummy and delicious! Slurp! Adding chaat masala to raita gives extra kick. looks so great and very inviting biryani !! Wow, biryani looks so flavorful and delicious..love the color..
Lovely clicks…and looks too delicious!! Nice color and looks so yummy! Thanks so much for stopping by and joining in my blog, you have wonderful space too, will be back to explore more…. Nice clicks . Love the color of the rice. what a nice color u got on the biryani! looks superb. Wow colorful, falvorful coriander biryani..Lovely spread. 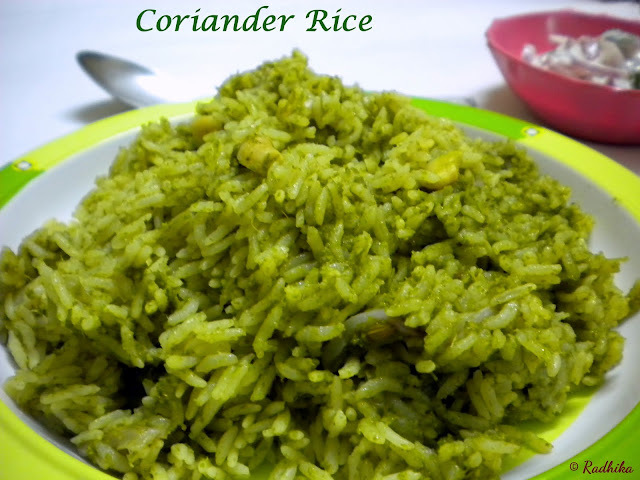 coriander rice looks absolutely delicious dear ! 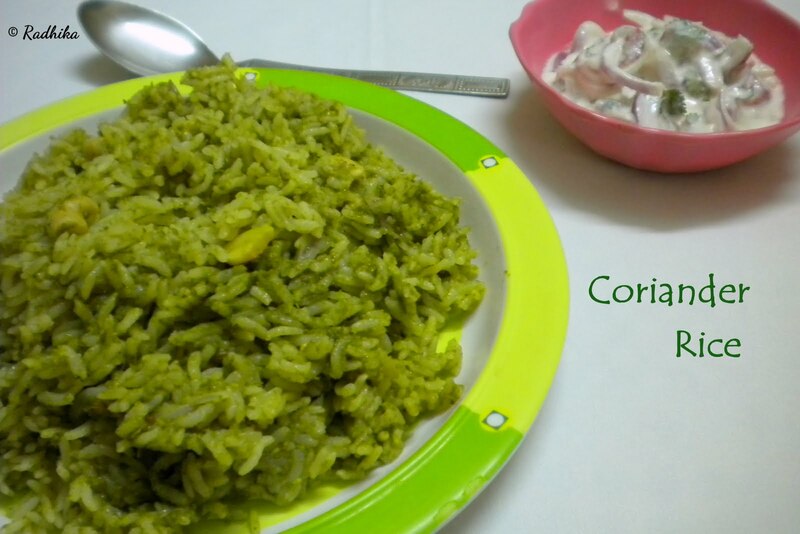 Coriander briyani sounds amazing,I have tried once before,love ur recipe! 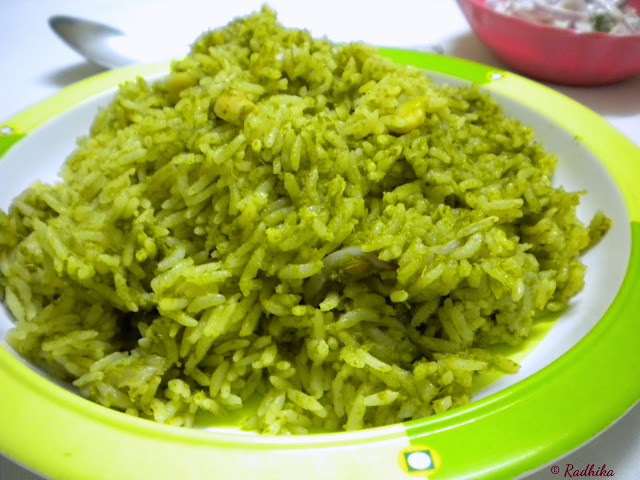 green rice is so tempting ! healthy ! 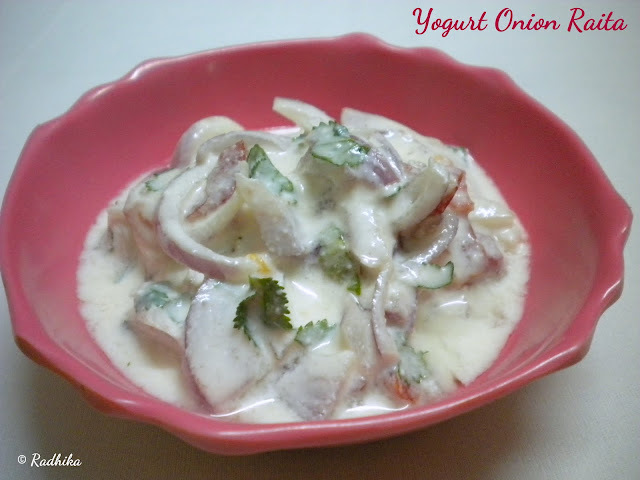 New to ur space n happy to follow u.. for more wonderful recipes. Delicious rice and raita, I love the green vibrant colour.My 1st visit here, following your blog , you have a nice set of recipes.Do drop by simply.food sometime.